That's right... Panic Analogue is now available to buy on cartridge from our shop! 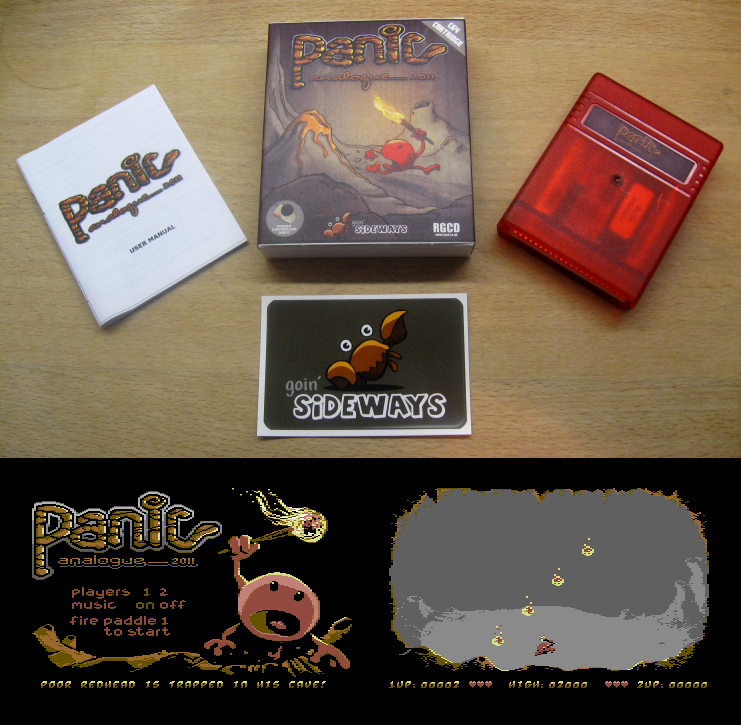 Goin' Sideways and RGCD are proud to present to you 'Panic Analogue', a fast-paced and highly addictive analogue paddle controlled game for one or two players. The game was developed as an entry for the RGCD C64 16KB Cartridge Game Development Competition (2011) and came third place out of 11 entries. Easy to learn, almost impossible to master, each of the 14 procedurally generated levels are carefully designed to challenge every kind of gamer - as well as offering almost unlimited replayability. Your objective is to keep poor little Redhead alive, trapped in his cave. It's a cruel world in there with droplets of water and fireballs constantly falling from above. In order to survive he has to collect every water droplet in his mouth to stay fresh, and keep his torch alit by catching the fireballs. If a water droplet hits the torch things will go very wrong - and swallowing a fireball of course also leads to pure catastrophe! NTSC and PAL compatible, Panic Analogue even works on the GS - the only requirement being a pair of analogue paddles. The original Commodore variety or Atari 2600 'Tennis' controllers will do fine, and the game website even gives instructions for making your own! The transparent red, internally LED-illuminated cartridge is packaged in a box designed by Redcrab and comes complete with a printed manual and credit card sized vinyl-coated sticker. As always, I will endeavour to ship out games within a week of purchase, but it may take a little bit longer depending on how many orders come in.